First off, the title is a little misleading. The just-completed Beer Bloggers Conference in Portland was definitely worthwhile and not a lost weekend. Well, a few people (no names) may have overindulged. What are you gonna do when you're in Beervana? So many beers to taste, so little time. There was much to like about the Conference. For instance, one of the first things I saw when I arrived on Friday was a line of people who were, yeah-huh, tasting beers. What better way to kick off a beer conference than by getting people lubed up before they even walk into the room? Thanks to Widmer, Sierra Nevada and Pyramid for providing some nice brews. The opening segment by Julie Herz took us through some great information on the state of an industry that is growing at, frankly speaking, an alarming rate. The stats essentially suggest that craft beer is bursting at the seams all over the country. Portland may have the most breweries in the world and the most vibrant beer culture (apologies to Asheville and brewgasm), but the concept of craft beer is taking hold everywhere. It's quite a time to be writing about (and drinking) craft beer. 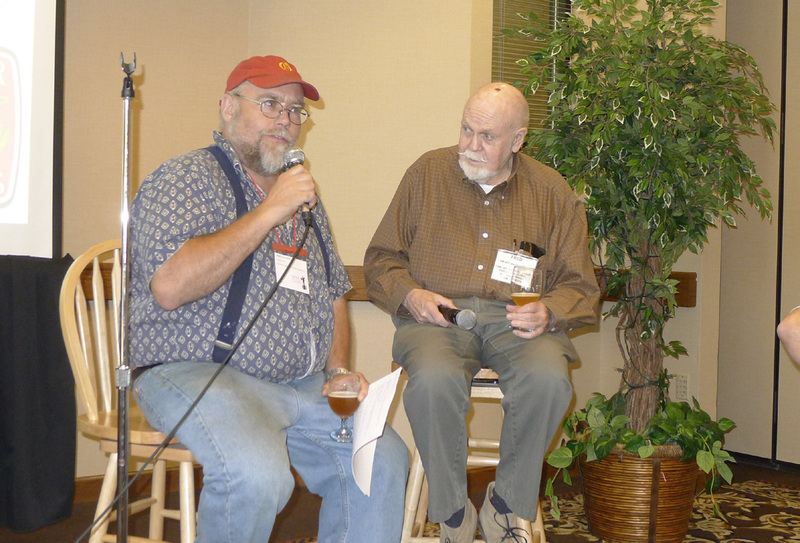 Possibly the highlight of the weekend was the Friday Keynote of Fred Eckhardt and John Foyston. If you don't know, Eckhardt is a onetime Marine and the dean of American beer writers. He has written several books and numerous articles on beer and has been an influential force on the Portland craft beer scene from day 1. Foyston has been writing about beer for The Oregonian since, well, forever. John: Do you have a blog? Eckhardt: I probably should write a blog. But I'm just too lazy. It just doesn't get much better. Two local legends on the stage clowning around while providing great insights into the state of craft beer today for writers from all over. Thanks to both of these great guys. 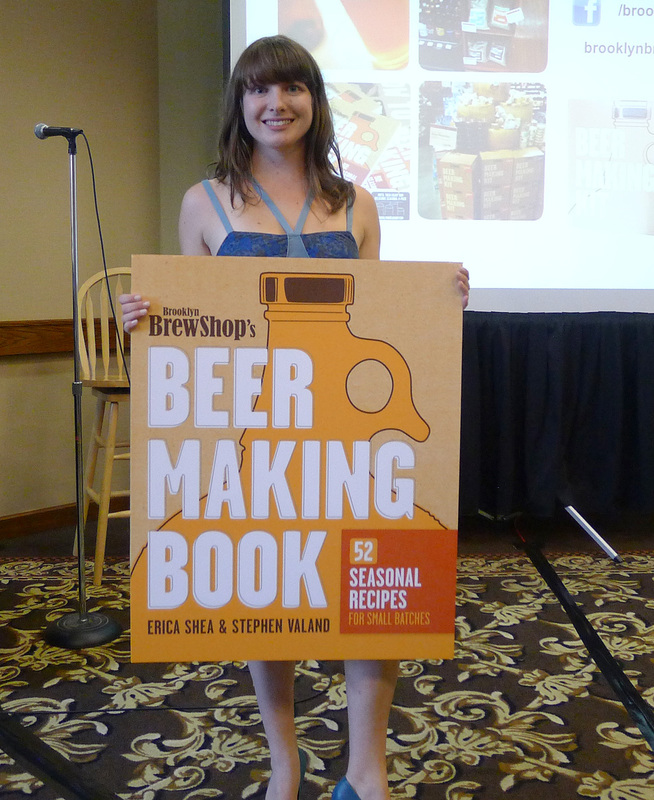 The team of Erica Shea and Steven Valand gave an interesting presentation on what they are doing with their brewing supply business in New York. Yep, you heard that right. Even in New York, interest in craft beer and brewing is growing. 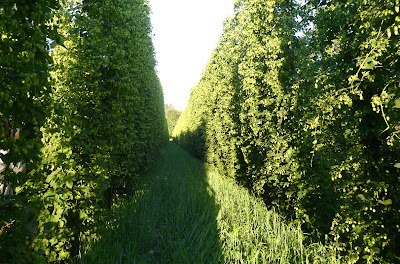 I recently read that they are starting to grow hops again in rural New York. This was once a very productive hop growing region and they apparently hope it will be again.What's driving it? 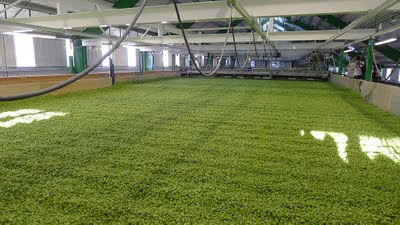 Demand for hops among craft brewers and homebrewers in the Northeast. Go figure. These guys talked about all kinds of things they are doing to increase interest in beer and homebrewing. They also mentioned using some strange ingredients (lobster?) to brew and, not so surprisingly, some odd results. But they have great passion for what they are doing and what they are doing is spreading the gospel of craft beer to an urban audience that hasn't always been in the loop. Big kudos! Our Friday afternoon excursion took us to the Goschie farm near Silverton for a tour of their hop production facility, followed by dinner. This would normally be a fairly short trip, but all bets are off when you hit rush hour traffic out of Portland. On a Friday. The trip took well over two hours. Fortunately, folks from the Oregon Brewers Guild (Ninkasi, Widmer, Oakshire, etc.) were aboard the buses handing out tasty beers. Their coolers were well-stocked, thankfully. I grew hops at home as part of my homebrewing phase a few years ago. 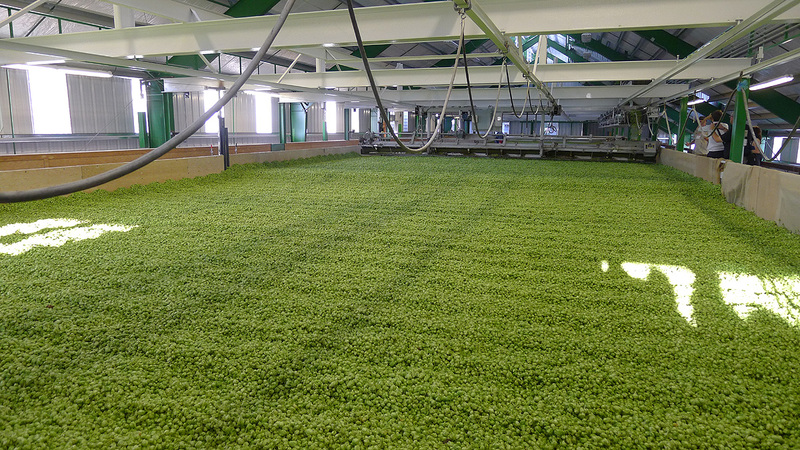 Seeing hops on a production scale is a different story. These things are growing on trellises that must be 30 feet tall. They are in harvest mode for some of the varietals grown at Goschie. We got to see the entire process. It's fascinating to see hop vines brought in on one end, cones separated, piled up to dry (takes 8-12 hours, apparently) and then eventually baled. Pretty amazing to finally see how it's actually done. Oh, kudos to the Oregon Brewers Guild and Gayle Goschie for hosting the trip. Dinner was great, as were the beers they had available there for all of us to quaff. I think a good time was had by all...maybe too good. I know the brewdad (Mike Besser) and a few others were passed out on the ride back to Portland. Long day, but a fun one. We listened to several informative presentations on Saturday, but I want to move on to what was billed as the marque event of the weekend, For the Love of Beer. The movie was served up at the Bagdad, following a terrific dinner at Bridgeport (thanks again to the Oregon Brewers Guild and to the folks at Bridgeport). I wrote about the movie in an earlier post, so I'll summarize here. Although brewing was for many centuries handled by women in the home, it became the domain of men with the coming of the industrial revolution. Today, women are slowly working their way into beer-related careers. 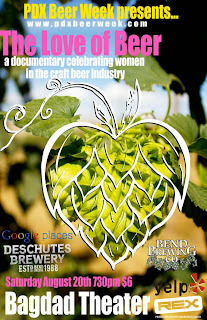 The movie focused on the stories of several women, particularly Sarah Pederson (Saraveza) and Tonya Cornett of Bend Brewing. It's a good movie. Hearing the stories of these women and seeing the passion they have for what they do was inspirational. They have made significant contributions to the craft beer movement in Oregon. Here's where I was disappointed: Although a number of women are featured in cameo roles, really only two of them get attention in the film. I wanted to hear more from Lisa Morrison, more from Chris Crabb, more from the others. Again, it's a totally worthwhile film. It just felt incomplete to me. Sunday came and went like a flash. For better or worse, the good folks at Oakshire Brewing in Eugene provided some morning wake-up nectar in the form of Line Dry Rye. Thanks for that! We enjoyed some great presentations from eight bloggers and I'll have more to say about some of them in due time. It was fun meeting so many people who are enthusiastic about beer. A lot of ideas were shared around. I hope to do it again.